Fees associated with filing patent applications in Kazakhstan as well as other patent fees are available in the fee calculator. The deadline for filing the application to grant a patent in Kazakhstan claiming priority is 12 months from the date of priority. The term may be extended for two months from the lapsed term if the applicant fails to file the application in spite of due care. - filing and formal examination fee. The patent application materials should be provided in Russian or Kazakh language. The application materials may be filed in any other foreign language; however, the translation into Kazakh or Russian must be provided within two months from the filing of the patent application in Kazakhstan. The Power of Attorney may be provided simultaneously with the filing of the application or within two months from the filing of the Kazakhstani patent application. Legalization or notarization is not required. Confirmation of priority right should be indicated in the request to grant a patent or within two months from filing the application. The certified copy of the priority application should be provided within two months from filing the application. The request to conduct the substantive examination, as well as proof of payment of the examination fee, should be submitted to the patent office within three months from the notification about positive results of the formal examination. The restoration of this term is possible within 12 months from the lapsed term on condition that the corresponding fee is paid. The official fees for grant and publication should be paid within three months from the date of issuance of the decision to grant a patent. The annual fee for maintaining the patent validity must be paid for each year of its validity beginning from the date of filing of the application. The first annuities are paid simultaneously with the official fees for grant and publication or within two months from the publication of the patent. The novelty of the invention is not disproved if the disclosure of the information about the invention was made within 6 months before filing an application by the applicant, inventor, or by the person who received this information from the applicant or inventor directly or indirectly. It is necessary for foreigners to perform the patent prosecution in Kazakhstan through an agent, a registered Kazakhstani patent attorney. 1. Online Search Databases: Kazakhstani Patents and Utility Models , Eurasian patents (EAPO). 2. 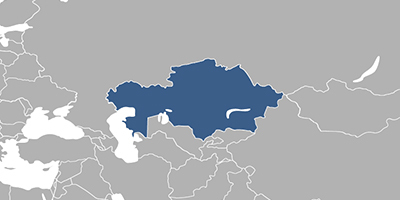 Patent protection in Kazakhstan may also be obtained via Eurasian Patent. 3. An invention may also be registered as a utility model in Kazakhstan.